This week, Staples announced that it won't be using its stores for just selling anymore. The office supply company is partnering with office-sharing startup Workbar to use a portion of the square footage in its brick-and-mortar locations as work spaces, separate from the areas selling toner, pens and paper clips. Starting with three Boston-areas stores, the collaboration is expected to increase store traffic, which has been dwindling at Framingham, Mass.-based Staples for years. Welcome to the store of the future. As technology enables ad blocking online and ad skipping on TV, marketers are increasingly searching for ways to better engage consumers in person. As consumers get more comfortable with e-commerce, marketers are finding they need to imbue their brick-and-mortar operations with updated missions. Many other marketers are toying with the model. Beneath a regular store in San Francisco, Target operates an Internet of Things concept store that functions as a learning lab for shoppers, while Reebok combines a CrossFit gym with its retail offerings at its FitHub stores. Amazon has brick-and-mortar pop-ups for its products. 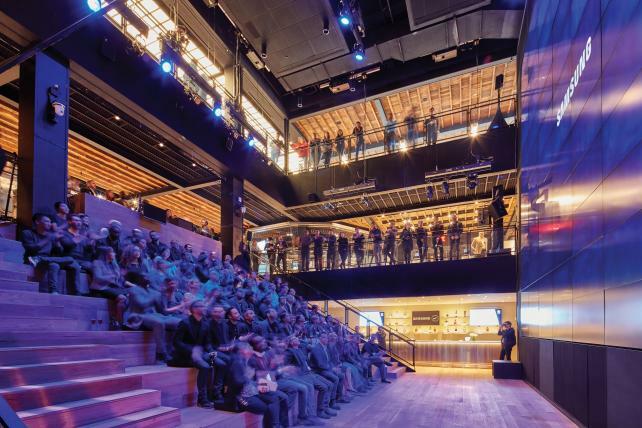 Even fashion designers are leaning toward more experiential locations and less in-store stock. In March, Tory Burch opened a store for athletic-wear line Tory Sport; the space hosts yoga classes and features a central interactive display where visitors can shop, play games and view curated looks. This is an excerpt from an article posted on AdAge.com. For complete article, click here.